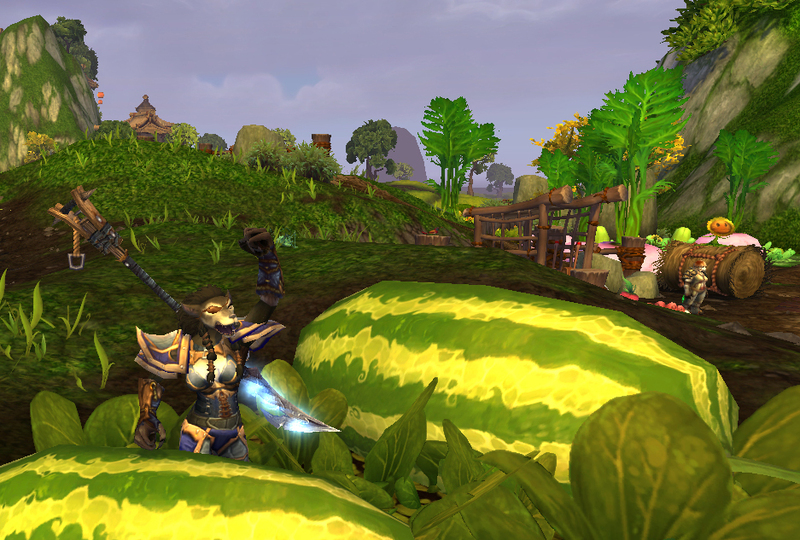 9/25/2014: This fight is now up to date for Warlords of Draenor. For an Elekk Carry, simply use the advice for a regular carry. 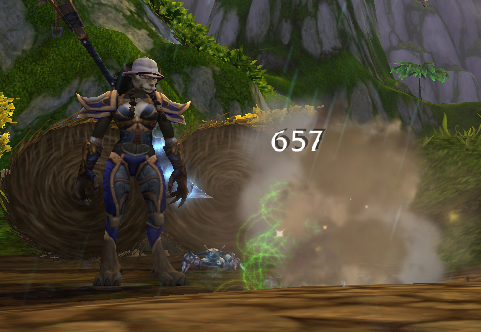 Nishi was the laughingstock of the Pandaren tamers for a good long while. 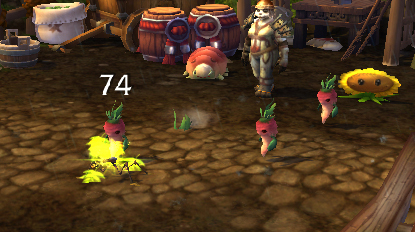 Most player tamers could solo her with nearly any level 25 battle pet. 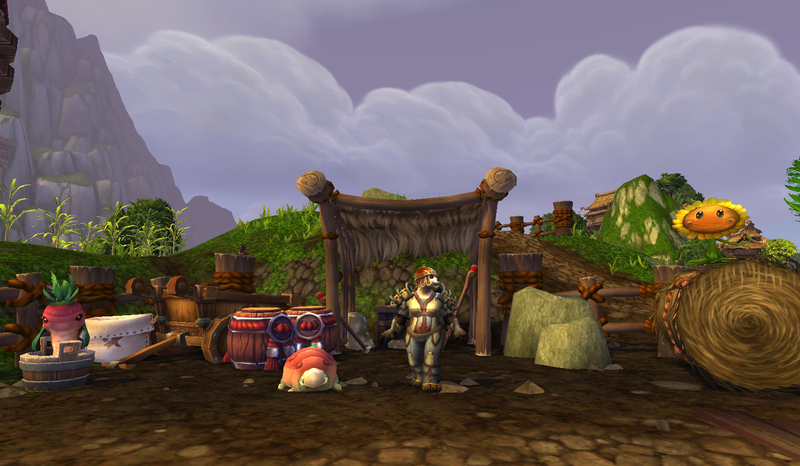 Located in the heartland of Pandaria’s Valley Of The Four Winds, she made an easy target even for those level 86 alts. However, a bug fix in 5.4 gave her claws. The abilities her pets avoided using in order to make her such a pushover were suddenly back in full force. Luckily, like most of the other tamers, as long as you know your counters, you are good to go. The Strider has a lot of very strong aquatic offense and a weather effect. I’ve used frogs in this slot too. Either is fairly reliable as long as you make sure to switch in that weather effect. The crab is pretty much just there for cleanup. 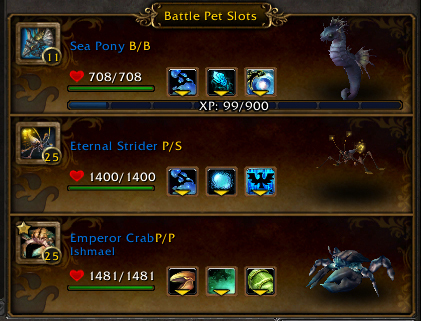 I’ve used mechanicals in that slot, because this battle pet will be facing Nishi’s beast, but if my first pet goes down early this can make for bad times because the rest of Nishi’s pets are elementals. A Flying with Lift Off or the Anubisath Idol makes for a good anchor too. The biggest chunk of your strategy begins immediately. Nishi’s Siren has Solar Beam, which hits very hard normally, but tacks on an extra big hit if it’s in Sunny weather. So of course the first thing Siren does is cast Sunlight. You need to change the weather, now. You have an intervening turn where Siren casts a heal on itself before it’ll explode your pet’s face off. If your first battle pet is above Siren’s speed (280) you can put in your carry pet off the bat and enough time to change the weather. However it’s important to note that if your pet is at or below 280 speed you won’t, so you’ll need to start with your first ‘real’ battle pet, and then swap in the carry pet further down the line. In this case I usually switch in the carry during Toothbreaker‘s Sons Of The Root, and make sure my carry is above level 8 or so. Either way is fine, but you just need to be aware of it before you start. After you change the weather, beating Siren ain’t no thing. The very first thing the next pet, Toothbreaker, will do is submerge and start hitting you with Sons of the Root while he’s immune. When I use the Strider, I use these turns to do things like heal (by casting my weather again) and set up Pump. You really just have to wait a handful of turns while you take a bit of damage. Just stay calm and take your turns. Then, when he surfaces, beat him up. His offense isn’t all that strong. Last pet, Brood of Mothallus, is a Beast with Burrow and Acidic Goo. That combo together can produce some devastating results. With the crab as long as I keep up heals and that shield I’m good to go, especially since Brood’s 3rd ability, the reflexive heal, is Undead damage. If I use an Anubisath, I use Stoneskin and Deflection to counter Burrow, and that’s all she wrote. With a Flying I use Lift Off when he Burrows and boom goes the dynamite. If I use a mechanical you know what I’m kind of running out of idioms to say I win, so let’s just say I win. Now help me figure out how I’m going to steal this melon before Nishi sees me. Here’s the video, recorded using the Elekk. This entry was posted in strategy, tamers, Uncategorized and tagged daily, elekk carry, guide, pandaria, tamer, walkthrough on February 19, 2014 by Liopleurodon. 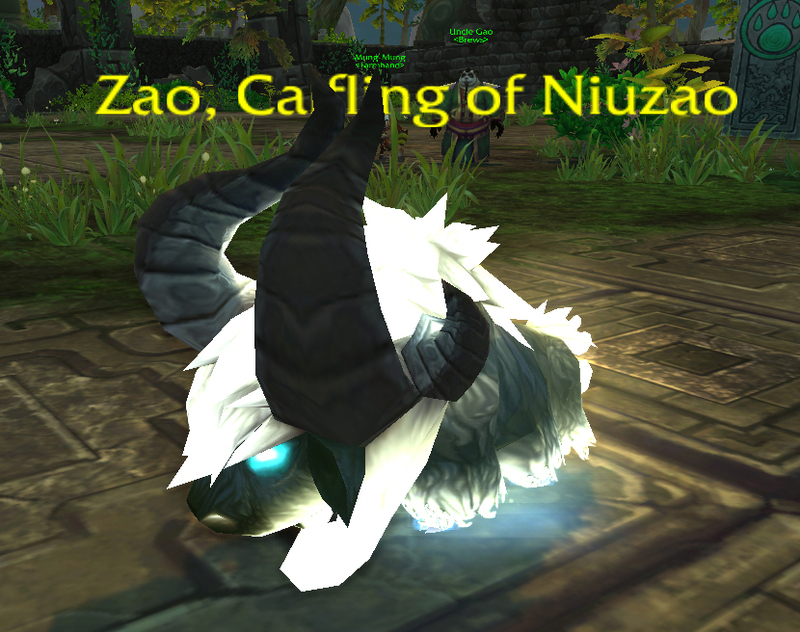 Zao is the last encounter I’m writing about, and as a result my witty repartee is broken. Uh, yes, it totally WAS witty. Throw me a bone here! 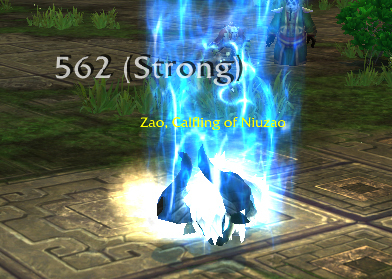 Zao has 2 old abilities and 1 new ability. The new ability is Charge, which is functionally similar to Deep Breath, where he charges up one round and then does huge damage the next. 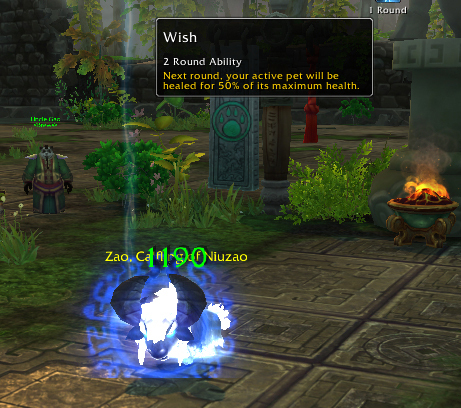 The old abilities are the typical beast damage ability Trample, and the pvp rage-inducing heal Wish. The breakdown on my strategy for Zao is a lot of bursty offensive firepower. If you have stuns this is a good place to use them. Call Lightning is fantastic here too. 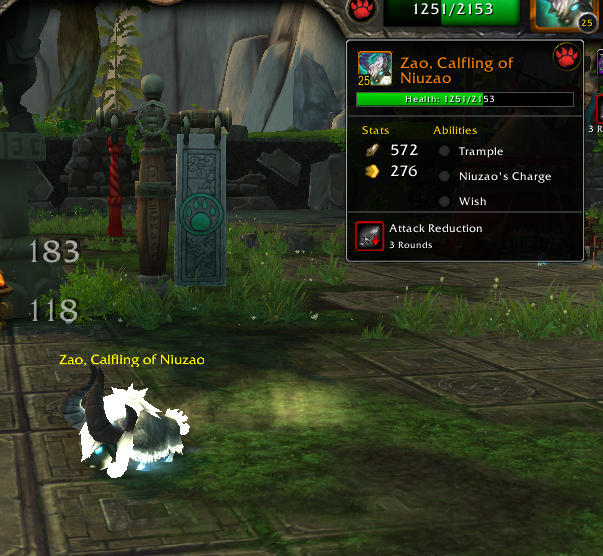 Any kind of avoidance is good, because as seen in the screenshot below his Charge does borderline one-shot damage. He takes that down turn to power up though, so you know it’s coming, making it relatively easy to counter. However, when I say “bursty firepower”, you need to be mindful of using abilities like Ion Cannon early on, because the “Boss” mechanic only allows you to do 35% of a boss’s health in a single hit. Those huge single hits frequently get partially absorbed, wasting that burst. I do like the Ion Cannon in my anchor slot as a last ditch Hail Mary, but not as primary offense. The Darkmoon Tonk or Menagerie Custodian are my choices for anchor, because they also have Shock and Awe, which gives a chance to stun. 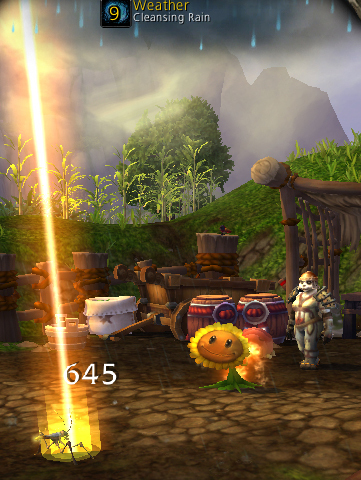 The boss buff is why I really like my trusty Clockwork Gnome with a Lightning Storm combo for this fight. It’s a good amount of DPS even halved, and there’s no way I’d hit that 35% per hit threshold because it’s all little hits. In general, you want to just unload on his face. While you unload though, you need to be mindful of Wish. I like to get all set up with thunderstorms and turrets and debuffs and stuff, and then blitz him down after his first Wish. It’s on a relatively long, 5-round cooldown so it’s better to just eat the first one while you set up your offense, and then use your big damage cooldowns right after he casts it. There aren’t a whole lot of other options for damage debuffs among pets with mechanical damage, and debuff stacking is my personal favorite strategy for nearly all the single-pet fights. One pet I didn’t have available on the PTR that I’m eager to experiment with on Live is the Cogblade Raptor, with Exposed Wounds and Batter. As always, the trickiest part of the scenario is where you need to think ahead and triage. The Gnome and Tonk are both fairly key in other strategies for the triads, but are also good here. Do you really need that Tonk to beat a pet in the early triad, or should you save it for Zao? I don’t know your stable, so I can’t give you that answer. Here’s the video of me beating Zao on the PTR. This entry was posted in strategy, tamers, video and tagged 5.4, celestial tournament, strategy, walkthrough on September 6, 2013 by Liopleurodon.